Kim Yu-Na (Hangul: 김연아; Hanja: 金姸兒, IPA: [kimjʌna]; born September 5, 1990 in Bucheon, Gyeonggi-do) is a South Korean figure skater. She is the 2010 Olympic champion in ladies singles, the 2009 World champion, the 2009 Four Continents championship, a three-time (2006–2007, 2007–2008, 2009–2010) Grand Prix Final champion, the 2006 World Junior champion, the 2005–2006 2005–2006 ISU Junior Grand Prix|Junior Grand Prix Final champion, and a four-time (2002–2005) South Korean national champion. Kim is the first South Korean figure skater to get a medal at the Olympic Games. She is one of the most well known athletes in South Korea. As of April 2010, she became the first in the world by the International Skating Union. She was also the first female skater to pass the 200-point mark under the ISU Judging System. Kim Yu-Na was born in 1990 in Bucheon, Gyeonggi-do, and moved to Gunpo when she was six. In March 2007, she went to Canada to train for her figure skating with her judge, Brian Orser. In 2009, Kim went into Korea University, but she still continued her training in Canada. The right spelling of her name is 'Kim Yeona'. However, when she applied for a passport, she wanted her name written as 'Yun-a', but the official made a mistake and wrote her name as 'Yu-na'. In Korean 'Yu-na' would be written as "유나" and not "연아". Kim began skating when she was seven years old. At that time, her coach, Ryu Jong-Hyeon, approved of Kim's talent. Because of this, he asked Kim's mother that Kim should continue to learn how to skate, saying that she would become a wonderful figure skater in the future. In 2002, she competed internationally for the first time at the Triglav Trophy, and won a gold medal there. A year later, when she was 12 years old, she won the senior title at the South Korean Figure Skating Championships. She was the youngest skater ever to win that title. She won her second international contest at the Golden Bear of Zagreb. In the 2004–2005 season, as a junior skater, Kim competed at the ISU Junior Grand Prix, which is a junior complement to the ISU Grand Prix of Figure Skating. She won a silver medal at the event in China and a gold medal at the event in Hungary. She won a silver medal at the 2005 Junior Grand Prix Final with an overall score of 137.75 points. She retained her National Championship title for the third year in a row on her way to the 2005 World Junior Figure Skating Championships. At that competition, she won a silver medal again, earning 158.93 points. For the 2005–2006 season, Kim was not old enough to compete at the 2006 Olympics. So instead, she went to the 2005–2006 Junior Grand Prix and won both of the contests, in Bulgaria and Slovakia. At the 2006 Junior Grand Prix Final, she won the competition by getting 28.34 points more than Aki Sawada, who had gotten the silver medal. During her freeskate, she made seven triple jumps, including a triple flip. 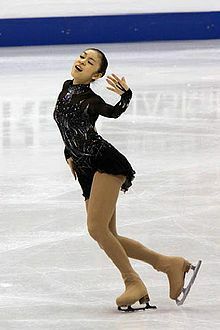 At the 2006 World Junior Figure Skating Championships, she was the rival of Mao Asada, a Japanese figure-skater, and won the gold medal. When she won this medal, she had made 177.54 points. Kim and her coach at the 2007-2008 Grand Prix Final. In order to prepare for her next contest in the 2006–2007 season, Kim practiced very much at the Skating and Curling Club of Toronto in Canada during the summer of 2006. She was trained by Brian Orser and David Wilson. Kim won a bronze medal at the 2006 Skate Canada after earning a score of 168.48 points. She won the 2006 Trophée Eric Bompard with a score of 184.54 points, 10.10 ahead of Miki Ando, the skater who got the silver medal. Those performances made Kim be allowed to the Grand Prix Final in St. Petersburg, Russia. At this place, Kim won, earning 184.20 points, which was 11.68 points more than Mao Asada, who earned the silver medal. Kim was forced to stop because she got hurt at the 2006–2007 South Korean Championships. Because of this, she had to go to the hospital. Kim was picked to compete at the 2007 World Figure Skating Championships. During the World Championships in Tokyo, Japan, Kim won the short program with 71.95 points, setting a world record. She placed fourth in the long program scoring 114.19 points, and finished the third one with 186.14 points behind Miki Ando and Mao Asada of Japan. Kim's points helped two more South Korean ladies come for the 2008 World Figure Skating Championships. In March 2007, Brian Orser became Kim's new full-time coach. Because she liked the training environment in Toronto, Kim made Toronto her training home. Her coaches included at that time Brian Orser, Astrid Shrubb, David Wilson, and Tracy Wilson. Kim started off the 2007–2008 season by winning the 2007 Cup of China with a score of 180.68 points, which was 24.34 ahead of Caroline Zhang, who had gotten the silver medal. At the 2007 Cup of Russia, Kim won both the short program scoring 63.50 points and the free skate with 133.70 points. So she set a world record for the free skate score under the ISU Judging System. She also did a flip jump-toe loop put together, a loop jump, a lutz jump-toe loop jump, an axel jump-toe loop jump, and a triple lutz jump. She was allowed to the 2007–2008 Grand Prix of Figure Skating Final in Turin, Italy. She won the short program with 64.62 points. With a score of 196.83 points, Kim won her second Grand Prix Final. Kim did not attend the 2007–2008 South Korean Nationals and also did not go to the 2008 Four Continents Figure Skating Championships because of a hip injury. Even though she still had back pain, she went to the 2008 World Figure Skating Championships in Gothenburg, Sweden. She was placed fifth in the short program with 59.85 points. She scored 183.23 points overall, and won her second bronze medal. Kim performing at the 2009 World Figure Skating Championships. Kim was assigned to the 2008 Skate America and the 2008 Cup of China Grand Prix for the 2008–2009 ISU Grand Prix season. At the 2008 Skate America, Kim was placed first in the short program with a score of 69.50. She went on to get the ladies title by winning the free skate with a score of 123.95. She won the event with 193.45 points, which was more than 20 points ahead of Yukari Nakano of Japan, who won the silver medal. Kim continued to win and earn medals at the 2008 Cup of China, where she received a score of 63.64 in the short program and 128.11 in the free skate, winning first in both of them. The became all together 191.75. Her performance let her into the 2008–2009 Grand Prix of Figure Skating Final|2008–2009 Grand Prix Final. During the 2008–2009 Grand Prix Final, which was held in Goyang, South Korea, she was placed first in the short program with 65.94 points and second in the free skate where she earned 120.41 points. She won silver medal with a total score of 186.35 points, 2.20 points behind Mao Asada of Japan. Kim contested in the 2009 Four Continents Figure Skating Championships in Vancouver, Canada. She set a new world record of 72.24 points in the short program. She also scored 116.83 in the free skating program, winning the gold medal. During the 2009 World Figure Skating Championships, held in Los Angeles, United States, she set another new world record of 76.12 points, surpassing her previous record by almost four points. She performed a triple flip-triple toe loop combination, a triple lutz jump and a double axel jump. At the same time, she earned a level four on all her spins. She also won the free skating program, scoring 131.59 points and showing great skills with her artistry and her musical abilities. Because of these, she set a new world record of 207.71 as well as winning her first World Championship title and she became the first female skater to go over 200 points under the ISU Judging System. Her score was 16.42 points ahead of Joannie Rochette, the woman who earned the silver medal. She was the only competitor who earned eights in program components marks in both the short program and the free skate at the competition. Kim was the only female skater whose triple-triple combination was seen by the judges in both the short and free programs during the 2008–2009 season. Kim skating, along with the 007 James Bond Medley at the 2009 Trophée Eric Bompard. Kim was assigned to the 2009 Trophée Eric Bompard and the 2009 Skate America in the 2009–2010 ISU Grand Prix season. At the 2009 Trophée Eric Bompard, she won first in the short program with the score of 76.08 points, 16.44 points ahead of Yukari Nakano. Her three spins were all graded as a level four. Showing great artistic skills, she won the free skate scoring 133.95 points. She won the event with 210.03 points, 36.04 ahead of Mao Asada. Kim set world records for the free skate. At the 2009 Skate America, Kim won first again, which was 17.48 points more than Rachael Flatt. She received +2.20 points for her triple lutz-triple toe loop combination. This was the highest point ever given for jumps by the ISU in ladies' figure skating. She also won second in the free skate with the score of 111.70 points, because of her mistakes in her jumps. Although it was one of her lowest scores, she still won the event with 187.98 points, beating Rachael Flatt. At the competition, she set a new world record again. Her victories in both Grand Prix events qualified her for the 2009–2010 Grand Prix Final in Tokyo, Japan, in December 2009. At the event, she placed second in the short program with 65.64 points, 0.56 behind Miki Ando. The next day, she won the free skate with 123.22 points. Because of all these, Kim finally won her third Grand Prix Final title with a score of 188.86 points. In February 2010, Kim competed at the 2010 Winter Olympic Games, where she won gold medal. In March 2010, Kim competed at the 2010 World Figure Skating Championships in Turin, Italy. Kim said she had tried but had a hard time with competing. She won seventh in the short program with 60.30 points. She opened with a triple lutz-triple toe loop, but had problems with her spinning. In the end, She won the silver medal totalling 190.79 points. Kim competed in the ladies event at the 2010 Winter Olympic Games, which was held in Vancouver, British Columbia, Canada. In the short program on February 23, she made a triple lutz-triple toe loop combination, a triple flip and a double axel. She set a new world record. On February 25, she won the free skate with a score of 150.06 points, 18.34 points more than Asada, who also came in second place. Kim was the only one who earned nines in marks. She set a new world record. Overall, Kim totaled 228.56 points, shattering her personal best and own old world record by a margin of 18 points. She won the gold medal, becoming the first South Korean skater to medal in any contests of figure skating at the Olympic Games. Kim's gold medal was South Korea's first medal at the Winter Olympics in a sport other than speed skating or short track. Kim and Stéphane Lambiel at the 2009 Festa On Ice. The places Kim advertised for are Anycall (mobile phone), Hauzen (air conditioner), Hyundai Motor Company (automobiles), Kookmin Bank, Korean Air, Lac Vert (cosmetics), Maeil Dairies Co.Ltd (Dairy products), Nike, Saffron (fabric softener). Her skating music and other favorites were put and sold in the album Yuna Kim ~ Fairy On ICE ~ Skating Music (Universal Music Korea, 2008). She was the headliner of the 2008 and 2009 Festa On Ice, which presented other world class figure skaters. IB Sports, Kim's agency, produced the ice show. The 2010 Festa On ice is going to be on April 16–18, 2010. IB Sports produced another ice show, Ice All Stars 2009, which took place in Seoul on August 14–16, 2009. Michelle Kwan, who is Kim's idol, joined the ice show. Kim was also named as an ambassador for the 2010–2012 Visit Korea Year. Kim has appeared on many commercials in South Korea. She sings in some commercials. Her commercial for a new touchscreen haptic phone from Samsung Electronics, dubbed as Yuna's Haptic (SPH-W7700), was done in South Korea on May 24, 2009. In the commercial, she plays a rock singer, a teenager, and a writer to show off various features of the phone. Samsung Electronics has sold over one million devices in a record seven months. Kim (center) on the 2010 Winter Olympics podium. South Korean 1st J. 1st S. 1st S. 1st S. 1st S.
Kim at the 2010 Winter Olympics medal ceremony. Kim with her gold medal at the 2009 World Figure Skating Championships. Kim during the ladies medal ceremony at the 2007–2008 Grand Prix of Figure Skating Final. ISU season bests highlighted in Italic. ↑ 1.0 1.1 "Yu-Na Kim: The Best is Yet to Come". International Figure Skating. Dec 2007. ↑ "ISU World Standings for Figure Skating and Ice Dance : Ladies". International Skating Union. 6 April 2010. Retrieved 6 April 2010. ↑ "Kim Yu-na Captures Skate America Title". The Korea Times. 2008-10-27. ↑ "[단독] 김연아 이름은 3가지?...영문표기의 비밀" (in Korean). ↑ "김연아 "남 의식하기보단 자발적인 노력의 힘" 연습벌레 근성이 성공의 발판" (in Korean). Newsen. 2009-05-18. ↑ "Skate Phenom Diagnosed With Hernia". Donga.com. 2007-01-04. ↑ "ISU World Figure Skating Championships 2007 Tokyo (JPN) Day 4". International Skating Union. 2007-03-23. ↑ "International Skating Union Communication No. 1469 Entries ISU Championships 2008". International Skating Union. ↑ "2007 ISU Cup of Russia, Day 2 report". International Skating Union. 2007-11-24. ↑ "Kim surges to big lead after short at Skate America". Icenetwork.com. 2008-10-26. ↑ "Kim posts record SP score at Four Continents". Icenetwork.com. 2009-02-05. ↑ "Kim sets new standard in ladies short at worlds". Icenetwork.com. 2009-03-27. ↑ "Top-10 ladies moments of 2008-09". Icenetwork.com. ↑ "2009 ISU World Figure Skating Championships, Ladies SP Scores" (PDF). International Skating Union. ↑ "2009 ISU World Figure Skating Championships, Ladies FS Scores" (PDF). International Skating Union. ↑ "2009 ISU World Figure Skating Championships - Ladies SP judges details per skater" (PDF). International Skating Union. ↑ "2009 ISU World Figure Skating Championships - Ladies FS judges detais per skater" (PDF). International Skating Union. ↑ "Kim takes gold in record-breaking fashion". Icenetwork.com. 2009-10-17. ↑ "2009 ISU GP Cancer.Net Skate America, Ladies SP Scores" (PDF). International Skating Union. ↑ "Kim's short has license to kill". Icenetwork.com. 2009-11-14. ↑ "Figure skaters gear up for 1 last big competition". usatoday. 2010-03-22. ↑ "Figure Skating: 'Bond girl' Kim ahead". Vancouver 2010: Figure Skating. 2010-02-23. ↑ "XXI Winter Olympic Games, Ladies FS Scores" (PDF). International Skating Union. 2010-02-26. ↑ 24.0 24.1 "Kim wins Olympic women's title". Vancouver 2010: Figure Skating. 2010-02-26. ↑ "South Korea's Kim Yu-Na earns figure skating gold". BBC News. 26 February 2010. Retrieved 26 February 2010. ↑ ":: Yunakim ::". www.yunakim.com. ↑ "Fairy on the Ice" (in Korean). Music Aladdin. 2008. ↑ "Kwan to Join Yu-Na in Local Ice Show". The Korea Times. 2009-07-02. ↑ "Yu-Na Named Amb. of Visit Korea Year". The Korea Times. 2009-04-29. ↑ "Yu-Na Becomes Model for Handset CF". The Korea Times. 2009-05-10. ↑ "록커로 변신한 김연아" (in Korean). 해럴드경제. 2009-05-22. ↑ "미 언론 '김연아폰' 신기록의 힘은..." (in Korean). Chosun Ilbo. 2009-12-24. ↑ 33.0 33.1 "Competition Results: Yuna KIM". International Skating Union. ↑ "Zveza drsalnih športov Slovenije". www.drsalna-zveza.si. ↑ "The Nymph of Figure Skating Waits for August". The Dong-A Ilbo. 2004-02-10. There was miscommunication between ISU and Korean Federation. Wikimedia Commons has media related to Kim Yuna.